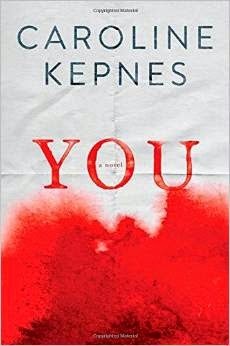 This is a book review for You: A Novel by Caroline Kepnes. I am using this book for my New to You Challenge (this was a debut novel from a new author) hosted by Herding Cats and Burning Soup. Here is my one regret with this book: it has been on my Kindle since November and I waited until now to read it. What was I thinking? This book is told from the point of view of Joe, a clerk at a local bookstore who becomes obsessed with a customer and apparently has a history of stalking behaviors. Besides teaching me that every single bookstore clerk is probably judging me for what I choose to buy, this book made me crazy paranoid about paying with a credit card anywhere. Most of us are pretty free with social media, right? It's kind of amazing the information Joe was able to get from Facebook and Twitter alone. I'll be honest: for about one chapter, I was rooting for Joe. Yeah, I know, I know. He's a stalker. But he didn't seem like that at first. This book also made me so glad I am not single anymore. Really, if I wasn't in Joe's head, I would never know that he was an obsessive stalker. He acts perfect. He's smart, he's nice to Beck's friends even when they aren't nice to him, he put up with her constantly breaking off dates with him. This book was edge of your seat suspenseful. I will not give away any spoilers for the ending, but OH. MY. GOD. I know we are only in January of 2015, but this may make the list of top books for the year. There is a reason I finished this book in a day. I managed to drag myself away for things like taking out the trash, feeding my dog, and taking a shower. My dog was very happy I didn't neglect her dinner. But I did neglect sweeping and mopping for this book. Those things aren't that important, right? Oh and found out from the author on Twitter there is a sequel coming out in September called Love. WHEEEEEEEE!!!! I can't tell you the happy dance I did when I found that out! As if it isn't completely obvious, I am giving this book a 5/5. This is my first perfect 5 star book of the year! OMG! I should go and read this now. Great review! Thanks so much Reviewing Shelf. I am so happy to hear this because I love this book so much and want everyone I know to read it! I'm so glad I read your review! I'd seen this book, but hadn't been drawn to it enough to find out what it's about. Now that I know, I think I need to read it! Except if there's a sequel, maybe I should wait. Either way, another one for my TBR list -- thanks! Yep. Tackling this book asap. This book sounds deliciously terrifying. Just added it to my TBR! Bookmark Dragon, "deliciously terrifying" is a great phrase that fits it perfectly. I hope you enjoyed it. I know I did! Nicole, you are so right! When you did that post, I actually thought about this book. It is incredible (and scary) how much information he was able to get just using things like Google, Facebook, and Twitter. I have this book and can't wait to read. Next, I think! It sounds so twisty and I love that. I have this one on my Kindle (Sparky) and plan to read it this week. I waited a while after downloading it, because so many reactions were negative. I am glad you enjoyed it...I have positive thoughts now.